Blending minimalist styling with approachable contemporary appeal, the Yeelight Galaxy LED ceiling light with a low profile and clean silhouette radiates modernity and simplicity with unparalleled sophistication. With simple yet future-proof design that does not distract from your well-curated interior aesthetics, Galaxy makes a distinctive statement with the absence of any excessive adornment. The LED ceiling light offers brilliant ambient lighting with the functionality and intelligence to help you make the most of your space to your own preference or in your own style. 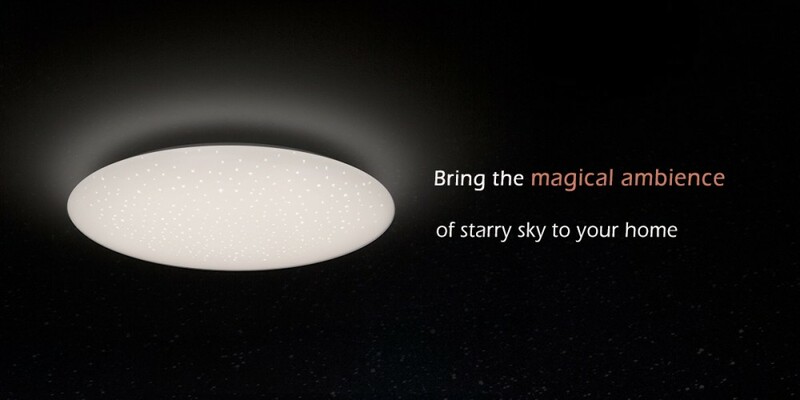 Bringing together adaptive lighting, wireless connectivity, and intelligent lighting control, Galaxy opens up a whole new world of possibilities to turn your everyday lighting into a gorgeous experience. Available in three different sizes: 450mm, 480mm, and 650mm, this universally appealing family of integrated architectural ceiling fixture accommodates all types of spaces including small and medium-sized interiors such as living rooms, dining rooms, bathrooms, entryways and hallways as well as large office, hospitality and commercial spaces. This low-profile ceiling light protrudes at just 3 and 6 inches, making it well-suited for mid-height and low-ceiling applications that require a low-protrusion fixture. Galaxy deliver all-around illumination with a uniform distribution of light to vertical and horizontal surfaces through a wrapped acrylic (PMMA) diffuser. The sleek, impact-resistant and UV stabilized opal diffuser is made to tolerate long-term heat exposure and has excellent impact strength and dimensional stability. It provides maximum transmission efficiency with excellent lamp obscuration whilst also controlling glare from every angle of view, adding a level of visual comfort and lighting quality seldom seen in this type of application. The Galaxy family is equipped with the best-in-class LEDs from Osram Opto Semiconductors to deliver the light quality, efficacy, lifetime and reliability that Osram LEDs are renowned for. The Galaxy LED ceiling lights produce 2200 lumens (480/450mm dia., @4000K) and 3500 lumens (650mm dia., @4000K) of exceptional quality light using only 32 and 50 watts respectively. Superior color rendering (Ra 95 @4000K) ensures that all colors and whites, including the crucial long-wave red range (R9) which is reproduced poorly by many less sophisticated LED technologies, are rendered perfectly. High color fidelity of the light source is critical in visual demanding applications and enables homeowners and lighting designers to create spaces where people prefer to live and work. Galaxy is designed to help you make a difference in how you feel about your environment. This thoughtfully engineered ceiling light provides the ultimate in soft, uniform, and diffused illumination. 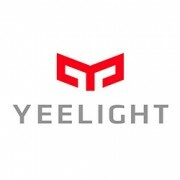 However, adequate illuminance levels, excellent glare control and faithful color reproduction are only minimal conditions for good lighting in Yeelight's philosophy. Galaxy ceiling lights bring visual perception to a new level by creating a pool of balanced ambient light that is both functional and mood-enchaning thanks to its deep dimming and CCT tuning capabilities. The integrated LED array uses dual-white CCT LEDs that allow Galaxy to achieve any color temperature within the 2700K-6500K range at any intensity of the light source. CCT tuning gives users the ability to adjust the white light temperature along the planckian curve from warm white to cool white or vice versa. 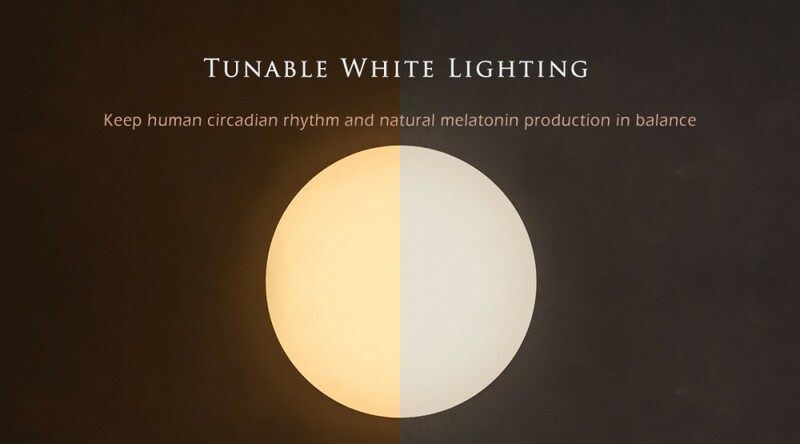 With tunable whites, you'll be able to create ambiences around the natural circadian rhythm. Activate impact of daylight to improve productivity and enhance concentration with high CCTs such as 5000K and 6000K, or emulate a warm and cozy evening to support the release of melatonin with 3000K or lower CCTs. The deep dimming feature allows users to gradually transition the light at any color temperature from full output to as low as 0.1 lumen. The ability to dim to the lowest possible brightness in conjunction with an optional star printed diffuser allows you to capture the stunning beauty of the night sky right in your home! From sunrise and sunset to moonlight, Galaxy delivers breathtaking lighting effects to foster a pleasant, comfortable environment that offers positive health effects and improves your visual and cognitive performance. Galaxy is a wonderful light that not only delivers you high quality illumination but also brings vibrant colors to your space for decorative and/or mood-enhancing effects. The ceiling light has an uplight RGB strip that radiates light to the ceiling and provides balanced luminance in the field of view. The uplight softens visual contrast associated with dark ceilings common to many applications and produces an open look and a sense of comfort that help relieve people of nervousness. With programmable color mixing to produce up to 16.7 million colors, the RGB LED strip creates every color your eye can see. The atmospheric uplighting allows you to customize lighting scenes, set decorative accent, and create drama and excitement. Wireless connectivity and intelligent controls are integrated to support a full spectrum of lighting features. 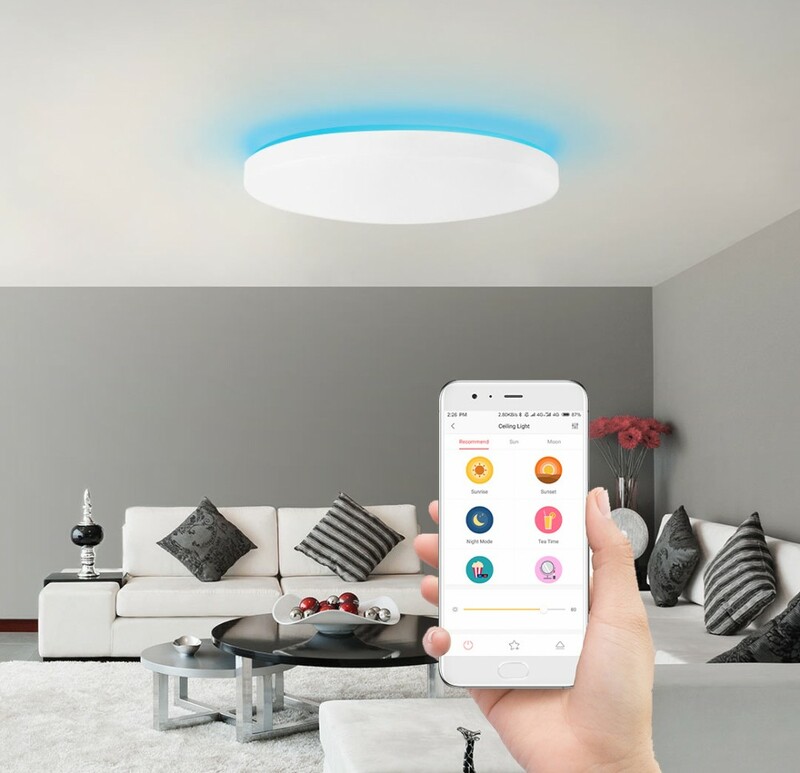 Download the Yeelight app from the iTunes App Store for iOS devices or from Google Play for Android devices and you have the cutting edge smart ceiling light at your fingertips. 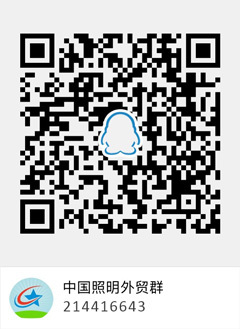 The user-friendly app allows you to control a single lamp, or group lamps and control them together via Wi-Fi connection. You can turn on/off or dim the light, adjust the color temperatures of the downlight LED module, pick a color for the RGB uplight, set schedules and timer, and create scenes from your phone or tablet anywhere in the world. You can even use voice control with Amazon's Alexa or Google Assistant. 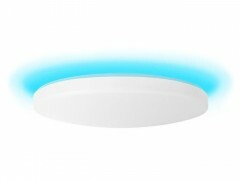 Link the smart ceiling light to IFTTT (if this, then that), a popular trigger-action programming platform, to add another digital layer to your lighting. Galaxy also comes equipped with Bluetooth remote control which offers you added convenience for lighting control. Galaxy delivers the ultimate in engineering innovation to bring the best of intelligent LED lighting to your everyday life. High flux density SMD LEDs are mounted to a thermally efficient metal core PCB with high reliability solder joints. The thermal resistance of all components along the thermal path from the LED chip to ambient air is reduced to a minimum. Superior thermal engineering contributes to the excellent LED lumen maintenance and chromaticity stability throughout the lamp's long rated life. State-of-the-art power electronics provide high performance load regulation with low total harmonic distortion (THD) and a high power factor (PF) for optimal LED performance. The constant current LED driver produces low ripple output current to eliminate unwanted flicker which can negatively impact visual experience and cause eye strain. The ceiling lamp is innovatively designed to facilitate quick installation and ease of maintenance. IP60 ingress protection eliminates your concern of having to clean insect trapped, dust accumulated optical diffuser every year. 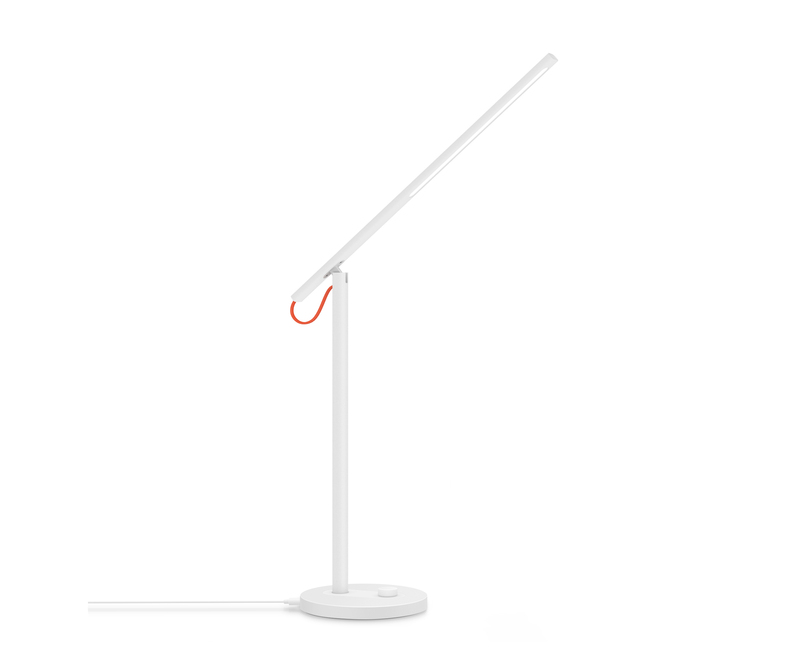 Sleek minimalist design provides a universal appeal to a wide range of interior spaces. High quality Osram light sources deliver high lumen output and high efficacy. Excellent quality of light with high color rendering index and low flicker values. High quality PMMA diffuser softens the directional light source with a good balance of diffusion and transmission. Advanced thermal management eliminates risks of premature performance degradation. High performance LED driver provides excellent load regulation. App-controlled remote access, color temperature tuning, brightness adjustment, automated scheduling. Deep dimming and full range CCT tuning support implementation of human centric lighting. RGB atmospheric uplighting provides the flexibility of creating the mood, color and ambiance desired. IFTTT integration allows for automated interactions between web services and the lights. Supports hands-free voice control with Amazon Alexa and Google Home.